There was little space to lie down on the floor of the cab, but Mhumhi and Kutta had made the best of it, curling up into tight little knots side by side. Above them Mhumhi could catch a dim glimpse of Tareq, slumped over in the chair. He was breathing softly. Around them, the train did not rattle very much, not as much as he remembered the city trolley rattling. There were no bumps on this track. Mhumhi only felt a very faint pull backwards, a sense of air moving rapidly outside their metal container. It made him wonder how fast they were going. Certainly much faster than he could run. He raised his head a little, nearly bumping Tareq’s dangling bare foot. If they could ride a train or car all of the time, moving Tareq would be much easier. Could they somehow learn to use one of the thousands of cars that were scattered motionless around the city? That was a thought. Beside him, Kutta gave a little sigh, digging her nose deeper into her brushy tail. They traveled for what seemed to be a long time in near-darkness, the only light coming from a dim little bit of florescence shining over the windshield. Eventually Mhumhi was conscious of the feeling that the train was slowing down. “Kutta, wake up,” he whispered. Kutta gave a little grunt, squeezing her eyes tighter shut. He extracted himself from her side, squeezing around to the other side of the chair, and put his paws up to look out the window. The dark tunnel was still rushing away behind them, but there seemed to be a little more light coming from in front of them. He wished they and Mini had switched positions. The train gave a little jerk, and Kutta burst to her feet, a bit wild-eyed, and tottered sideways against the door. “I think so,” said Mhumhi, swallowing. On the chair, Tareq was sitting up and rubbing his eyes. “So we must be inside the dispensary now,” said Kutta. The train had nearly stopped, and she scratched at the door. “Wait until it finishes,” said Mhumhi. “We don’t know what will be out there…” He was thinking of those shining hooks again. Out the windshield he could now see a great deal more light, as the train moved into a broader concrete area, much like the one at the station they had last been at. It was almost identical-looking here, with a flat concrete floor and a foreboding, heavy ceiling far above them. Mhumhi felt a renewed sense of their underground-ness. How many hundreds of pounds of earth were pressing down on that ceiling above them…? No, better not to think about that too much. The train stopped, and at once Kutta got her teeth around a handle and tugged, unlatching the door. They were greeted with a familiar-sounding hoot. Mhumhi flinched. A screamer was scrambling back, away from the train. “We might as well have gone in a big circle,” said Kutta, eyeing the station, and Mhumhi was inclined to agree. There were more screamers here, scattered about, some lying on the benches- except there were a great deal fewer, that he had to admit. There was one other major difference. Ahead of them, directly across from the train, there was a broad tunnel entrance, wide enough for a truck- and in fact, there was a truck parked directly beside it. Mhumhi saw more screamers lying down in the bed of it, their arms around one another. “That must be the way to the city,” he said, indicating it with his nose. Mhumhi gave a whuff of agreement, tensing to jump, but hesitated. Tareq had put a hand on his back. “Where’re we going?” he asked. He had to give a little wag as he said it, because for everything that had happened, he still missed the place. Tareq’s expression did not change much. “The sti-? Oh, the sewers. Well, I don’t know,” Mhumhi admitted. “Maybe,” said Mhumhi, though he privately would have taken that as his last choice of all. Tareq got down from the chair, squeezing his hands into Mhumhi’s fur, and Mhumhi helped him down from the train. A hyena yowl greeted them, Vimbo bounding over from the opposite end of the train to raise his leg for Kutta. Vimbo put his leg down and gave a grunt. They took Tareq over, though he seemed a little reluctant. “She’s sick,” he said, when they came upon Mini, lolling weakly in the doorway. “What’s your idea?” asked Mhumhi, nudging Tareq, who was making a face. “Do as she says,” Kutta told Tareq. She seemed impatient, glancing towards the truck and the tunnel. Tareq screwed up his face and picked Mini up, holding her at arms’ length. Mhumhi couldn’t really blame him; the bad smell coming of the little dog had gotten markedly worse over time. “Have you asked Vimbo if that’s all right with him?” asked Kutta, fixing Mini with her yellow stare. “Of course it’s all right with him,” said Mini, which Mhumhi felt wasn’t really an answer. Still, when Tareq raised his arms to gingerly arrange her over Vimbo’s neck, the hyena seemed remarkably calm about it. When Tareq stepped away, Mhumhi could see at once that Mini’s plan was not going to work. Though Vimbo was holding quite still, his head tucked down demurely, Mini was already listing to one side, despite her scrabbling forepaws. Unlike the little screamer, she had no fingers or toes to hold on with. “Pick her up again before she falls over,” he urged Tareq, as Mini slid down dangerously. Tareq obeyed him, and Mini pushed herself up on his arms with her forepaws, panting. “It was worth a try,” she said. “Why should Vimbo have to carry you?” asked Kutta. Mini turned her pop-eyes in her direction. Mini caught his eye, and Mhumhi couldn’t help but give a little smile. Kutta didn’t appear to notice- she was already on the move, trotting towards the truck. They went to the tunnel, dodging the occasional grab from a screamer. The screamers themselves seemed less interested in them than the ones that had been clustered at the first station, Mhumhi noted- though there was a general drift of them down the tunnel with them, they did not really seem to be focused on following them. Mhumhi knew what she was talking about. A strong stench was beginning to fill the tunnel, a scent Mhumhi found difficult to describe. It wasn’t as if he’d never smelled it before- that wasn’t exactly right- it was just very… busy. A thousand things all mashed together, an overwhelming medley, aged and ripened. The closest thing he could have compared it to was the faint scent lingering on the inside of the trash can where Lisica had once kept her cubs. “What part of the city smells like this?” Kutta wondered aloud. Mhumhi took another deep whiff of the odd scent. It was possible- there were meaty aspects to it- but it was all in such a jumble that he couldn’t have said for sure. The smell got very strong as they reached the end of the tunnel. There were a pair of iron gates at the end, very large, but they were hanging open. Mhumhi saw that a couple of young screamers were climbing on them, their laughter echoing down the tunnel. “What’s that!” exclaimed Tareq, bright-eyed, and plunged down and grabbed something off the ground in his little fist. Mini, suddenly only supported by one arm, flailed wildly. “Be careful!” urged Kutta, bounding over in a worried way, but Tareq put Mini on his hip and held out the thing he was holding. Mhumhi looked at it, gave it a cursory sniff, but had to admit that he didn’t have a clue. It was some sort of device, that was certain, for it was square and plastic with a shiny black screen on the front with a single button. “What’s it do?” asked Tareq, looking down at her. “That’s good,” said Tareq, with a smile. “Why, have you got someone you want to call, Tareq?” asked Mhumhi, waving his tail. “Yes,” said Tareq, and he adjusted Mini again so he could clumsily tuck the phone in the waistband of his pants. She paused, for her head was becoming rather squashed, her ears shoved forward and covering her eyes. “Put her down for a moment, Tareq,” said Kutta, taking pity. “Okay,” said Tareq, and plopped Mini down on the ground. Vimbo gave a little noise and stepped forward, nosing her. “Get off, I’m all right,” she said, and sneezed three times in rapid succession. “We ought to go, then,” said Kutta. They all stood still as another breeze came by, ruffling their fur. A few meters away Tareq was rooting through the trash, a second phone gripped in one fist. “Let’s rest here for a little while,” Mhumhi suggested, turning his face to that breeze. Despite the smell, it felt surprisingly nice. “I suppose so,” said Mini, yawning, and said something to Vimbo. The hyena blinked at her. “Right!” said Mhumhi, feeling a stirring in his chest. Kutta ran forward and he followed, leaping over mounds of trash, slipping and stumbling as things slid underneath their feet. Smells were bursting forth from everywhere, released by their every step. Mhumhi kept having to stop and shake his head. “Up here,” called Kutta, scrambling over a pile of bottles, sending them bouncing every which way in a miniature plastic landslide. Mhumhi flinched as one smacked him in the head. “Careful,” he said, but Kutta was ignoring him, her tail wagging, for she had reached her vantage point. “Come and look at all this!” she called. Mhumhi made his way after her, trying to pick out a less slippery path. The sun, which he had not felt in a while, was warming the darker places on his fur, shining through his ears and through the green bottles all around him. “Look down there,” Kutta was saying, but the first thing Mhumhi noticed was how vast and blue the sky in front of them was, over the rolling mounds of garbage. It was bluer than he had ever seen it, with only a few small wisps of cloud interrupting its spectacle. “Why’s the sky so blue?” he asked. That breeze brushed by them again, and Mhumhi pricked his ears. He could hear a faint nose, like he’d never heard before- some sort of mournful cry. He looked down across the trash now, and saw what Kutta must have been indicating. It was crawling with screamers, crouching and shuffling, intent on picking through the garbage. Sometimes they would stop to shove something in their mouths. Mhumhi sat down, tilting his head. They were certainly intent on their work- not one of them had so much glanced over and noticed the pair of dogs watching them. Mhumhi saw a female with two littler ones at her sides, tugging at her arms. When she pulled something up out of the garbage they reached their hands out, bleating, and she hesitated and gave it to the larger one on her left. It gobbled it up at once, while its smaller sibling continued begging. “There’s a fight,” said Kutta, suddenly rearing up on her hind legs. Mhumhi followed suit to get a better look. In the distance two screamers were having a loud altercation, hooting and shrieking and shoving at each other. One sank his teeth in the other’s shoulder, eliciting a howl. “What’re they fighting over?” Mhumhi wondered, going back on all fours again. “I can’t imagine it’s anything other than food,” said Kutta. “I suppose they must be…” She seemed to cut herself off, pressing back her ears. The two screamers seemed to have finished their fight, with one skulking away, clutching his shoulder. The other sat down and picked something largish off the ground and began biting at it. Mhumhi noticed that there were a few other screamers clustered around at a respectful distance. “It’s a screamer, not a hulker,” Kutta pointed out. They made their way down the pile of trash, passing through the multitude of screamers, many of whom stopped their picking and stared. “They must have never seen dogs before,” said Mhumhi, glancing around, but there was no aggression that he could see, only blank-eyed bewilderment. The large male screamer that they were heading towards was holding into the thing he had in his hands with gusto, tugging pieces of it away with his teeth. 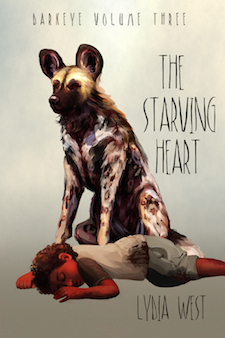 As Mhumhi and Kutta approached, his little crowd of hangers-on scattered, but he did not look up, intent on his meal. Mhumhi smelled blood. “It’s some sort of meat,” said Kutta, hesitating with one paw raised. Mhumhi stole forward a few more steps. Kutta slunk forward to his side. The screamer was tilting the object this way and that, so it was hard to get a good look at it, but Mhumhi could see at least one eye, and a bloody tongue. There was fur, and a pair of horns, like there had been on the cow. But this head was too small to have come from a cow. The screamer tugged another mouthful of meat from the gaping neck with apparent relish. Mhumhi looked again at the eye, which was yellow, with a square pupil. Mhumhi’s nostrils flared. He could smell more meat nearby. “Behind him,” he said, trotting around. The screamer gave a sudden howl and flared, striking out with his arm, and Mhumhi leapt away. But he had a leg clenched between his teeth. “Good job!” said Kutta, wagging her tail. The screamer, behind Mhumhi, had frozen, apparently just now having noticed what the thief looked like. Mhumhi bounded away, his prize protruding from his jaws, and Kutta followed him, laughing. They stopped a little ways away and ate quickly, stripping the leg down to the bone in a few bites. It was a short leg, ending in a hoof, and there was little meat on it. Still, Mhumhi felt invigorated, and licked his reddened chops. “Let’s look around some more,” he suggested, wagging happily. “Yes, yes,” said Mhumhi, lowering his head a bit, and followed her back over the large ridge of trash. Behind them, screamers suddenly converged on their abandoned bones. They went over top of the ridge, finding better footing this time. Mhumhi’s ears pricked again. He could hear that same mournful cry again. Kutta’s head came up- she had heard it too. “It’s this way,” Mhumhi urged, turning mid-stride to bound over another pile of trash, leaping over tires. The noise was getting louder, and it sounded like it came from more than one mouth. Kutta caught up with him as he stood at the top of the heap, ears and tail erect. “What are those things?” she exclaimed, staring down at the multitude of small white creatures walking about on the garbage below them. “They’re birds,” said Mhumhi, with certainty. He had only ever seen the one in the Great Glass Garden, but the look of them was unmistakeable, even though these were white instead of black. “What’s a bird?” asked Kutta. A mischievous thought stole into Mhumhi’s brain then. “I’ll show you,” he said, wagging, and then threw himself headlong down the slope, making a beeline for the flock. Their reaction was immediate, and more delightful than he could have hoped for. They burst into the air in a white flurry of scolding and shrieking. He leapt up, snapping at them, twisting himself. Behind him he heard Kutta gasping with laughter, and she sped by him, igniting another maelstrom of wings. They gazed upwards, panting together, at the swirling cloud above them. The birds had narrow wings, and they glided around effortlessly, loosing more of their mournful cries. The sky above them was still that brilliant blue. Mhumhi happened to glance out, and was struck dumb for a moment, staring. “Look,” he managed to say. “What is it?” asked Kutta, still grinning broadly, and followed his gaze. There was a gap between the tall mounds of garbage ahead, where the white birds glided to and fro and came to land. Beyond that, they could see water, glittering water, rolling in waves over and under the garbage. The breeze came over them again, smelling of salt. “bad smell coming of the little dog” coming from, coming off of? “shining through his ears” what? Hey Jes, would you be interested in a free set of ebook copies of the edited volumes of Darkeye? Inquiring minds that are very grateful for all your comments would like to know.